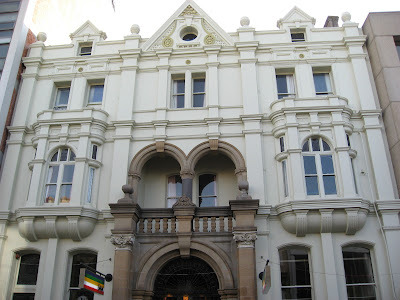 The Drill Hall Emporium: Launceston boutique shopping and a great Tasmanian provincial cafe! Launceston boutique shopping and a great Tasmanian provincial cafe! One of my favourite stores in Launceston is The Vintage Rose which happens to be right near the Albert Hall, the venue for the Launceston Antiques Fair (see previous post for our stand at this fair). Owner Amanda has such a flair in choosing and displaying her lovely vintage and French inspired home wares and linens. Unfortunately I was too busy at the fair to visit her store on this trip to Launceston, but I took some after hour images of the great window displays... I was quite taken with the big earthenware pitchers on the ladder. For more on the Vintage Rose click here. Next stop was Gallery 54 in St John Street, Launceston a boutique showcasing the delightful jewellery designed by Katherine Brunacci. At the gallery's opening last April (see previous post) I bought some gorgeous semi-baroque pearl earrings. 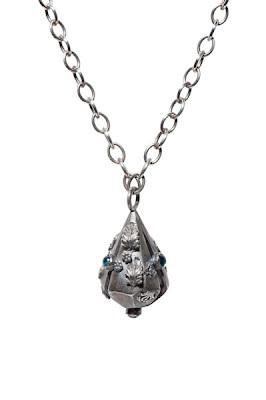 This time I fell totally in love with and subsequently purchased the above silver and gemstone pendant necklace titled "Lantern Pendant" from Katherine's Autumn 2011 collection. It is a truly magical piece and features moonstones around the lantern shaped pendant. It is beautifully hand crafted and is weighty, too. Other examples of Katherine's work. 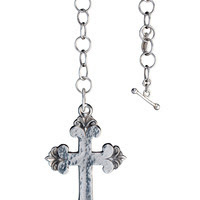 The sterling silver crucifix necklace features a handmade chain of adjustable length and the cross is inspired by a Victorian period crucifix. 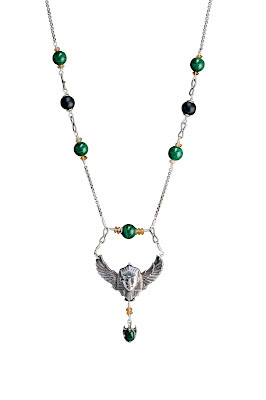 The winged pharaoh necklace has malachite and fire opals incorporated into the chain. Too many gorgeous pieces to choose from! A lot of Katherine's pieces are limited editions for example the Lantern Pendant of which there is only one more available. For more on the talented Ms Katherine Brunacci click here. After we had packed up at the antique fair and on our way home we stopped at the Ut Si cafe in Perth, northern Tasmania for lunch. I enjoyed a warming Jerusalem artichoke and potato soup with their famous wood fired bread. I was a little jealous of a fellow diner's mushroom and pearl barley risotto though! A friend has started a new blog titled "touche de vintage" which will feature vintage pieces incorporated into fashion. To visit, click here. Sounds like everything went well at the Antiques fair. I love going to Launceston too and was up last week and visited Amanda's store. I could have bought everything! Don't get to Launceston half as much as I'd like, probably just as well. The jewellery all looks stunning. Love what you picked out, always hard to make a decision when it's all so nice. I will have to keep in mind the Ut Si cafe if I'm ever in Perth. Food sounds devine. Have a good start to your week. The weather here today has been horrible wet and cold! love your blog - its all so exotic to texans! Thank you everyone for your lovely comments, I am glad that Tasmania seems exotic and beautiful to those who are far away. Thank you Joni from Cote de Texas for your kind comment. Janine, yes do try and get to Ut Si cafe if you go to Perth...it is worth the drive from Launceston even if you are not going south. Have a great weekend!